R.W. 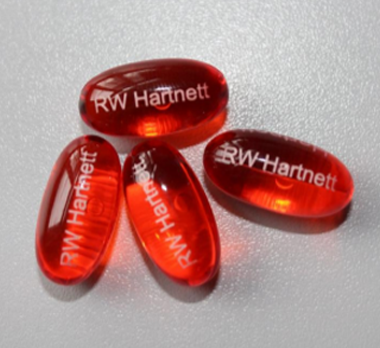 Hartnett Company manufactures custom laser printing machines to suit your pharmaceutical printing needs. 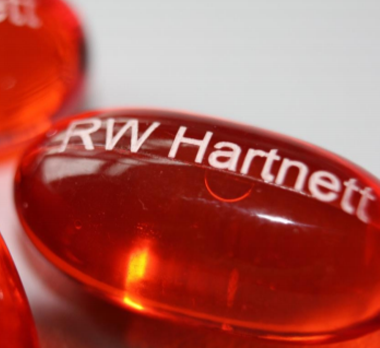 Our high-quality laser writers can mark just about any softgel capsule or tablet clearly and efficiently, making it easier than ever to identify your products. Laser printing, also referred to as laser etching, laser marking or laser writing, is used in the pharmaceutical industry to imprint a logo or other identifying mark onto the surface of a soft gel capsule or tablet. In the pharmaceutical industry, it’s important that your products be clearly labeled. Our printers allow you to add your name, logo, dosage, or any other identifying information to your products. With pinpoint precision, the quality and crispness of our laser printers is unparalleled. We manufacture custom laser printing machines of all types. Our machines can be equipped with UV lasers, C02 lasers, or Air Cooled lasers, depending on your specific needs and the product that will be etched. If you have any questions about which type of laser is best for you, feel free to give us a call at 215-969-9190. Our laser printing machines can etch one or two sides of almost any size or shape softgel. With vision inspection available and single unit rejection, you can be sure that you are producing the highest output of the best quality product possible. As safety is a top concern, our laser writing operations are fully enclosed in our printing machines to ensure the safety of the operator. Speaking of operations, our user-friendly HMI makes it easy to run the machine; additionally, our printers are designed to make changeover between products effortless. So whether you are printing one softgel, or a number of different sized capsules and tablets, our laser printer can do it all. We also offer Laser Drills for osmotically controlled oral drugs. Learn more about our laser drilling machines here.